It’s funny how ones thoughts on a locale are defined by what came before and after. As we sit in sprawling, hectic Chiang Mai, I am wishing for the peaceful calm of Luang Prabang. 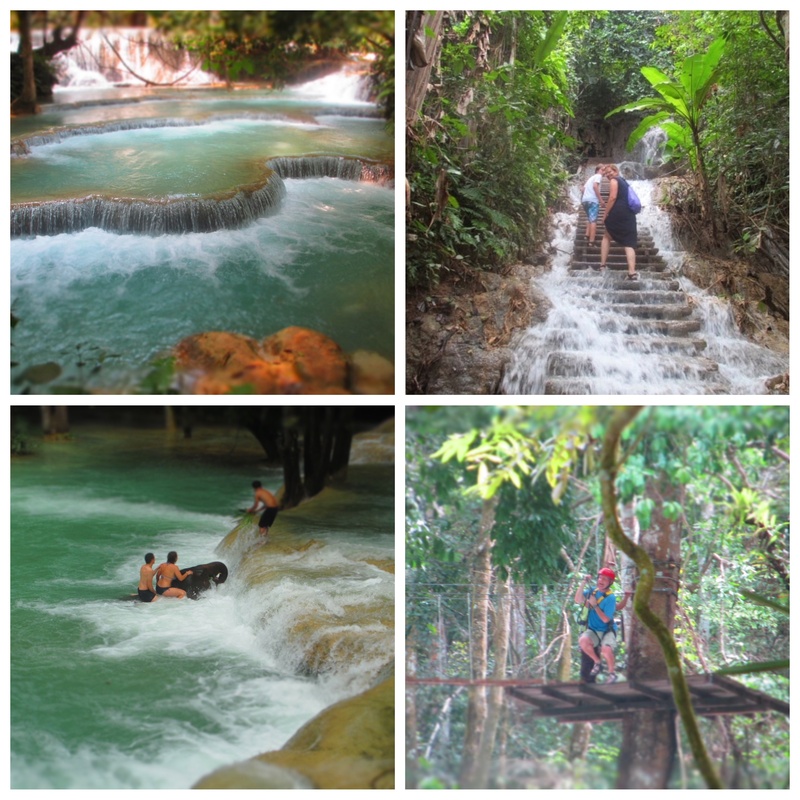 Kuang Si Waterfall leads the pack: Its true…it is simply stunning. So what if hordes of tourists arrive by minivan loads in the afternoon…go in the morning, swim through that robin egg blue water, swing from the tree rope, climb up the stairs as water cascades over you, and take a ton of pictures because it doesn’t get more beautiful than this. Takes about an hour in a tuk tuk, 160,000 kip (US$20) for a “private” tuk tuk (just our family of four). You’ll see the bears of Free the Bears on the walk in. Rescued from poachers, they recline on tree trunks and watch you as you watch them. Tad Sae Waterfall: Most take a longboat to Tad Sae…we hiked in on day two of a trek. It’s a bit bizarre to emerge from the quiet jungle, muddy and sweaty, into a sea of tourists enjoying BeerLao and elephant rides. Nevertheless, Tad Sae is gorgeous…an oasis in the jungle complete with swimming, elephants and zip lining. Bring plenty of kip…we didn’t have enough on us to all zipline…the boys went while the girls swam. 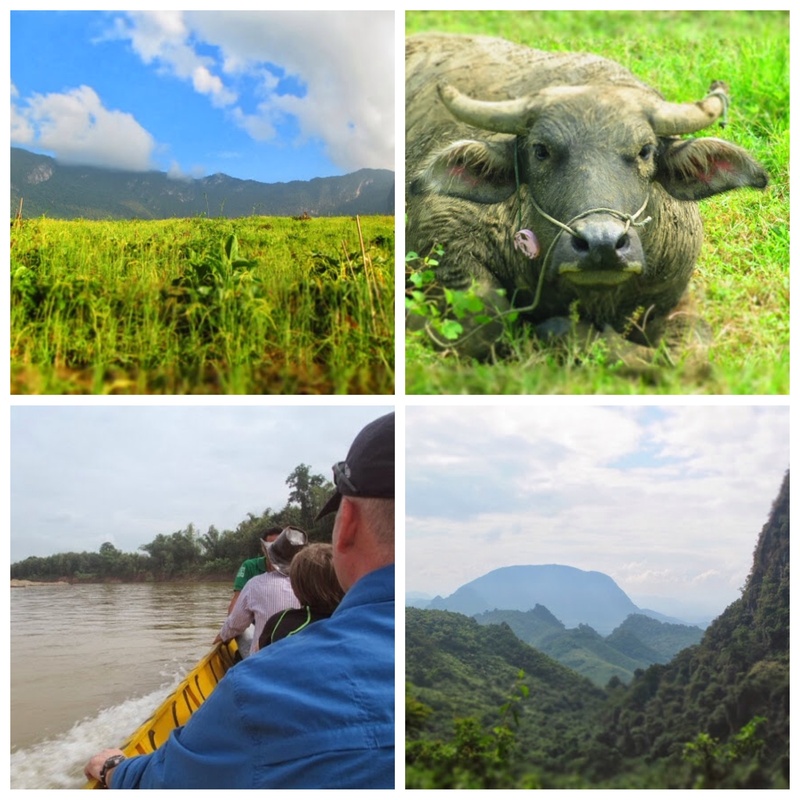 We had made the conscious decision before going to SE Asia not to ride elephants and simply watched…more on that in a future post. Tad Thong: hmmm…the brochure looks so promising. We hiked there from Hillside Resort — I think if we’d taken a tuk tuk all the way from the city, it would have been a disappointment. What it has going for it: it’s tourist-free. And a series of concrete steps have been built meandering for some time from waterfall to waterfall which makes for a lovely walk. However the waterfalls themselves are no comparison to Kuang Si and Tad Sae and there is trash in the water. UXO (Landmine Museum): A five minute tuk tuk ride from the peninsula, this is a must do. While not as large as the Siem Reap Landmine museum, it is more direct to the issue and has a striking video explaining the history and state today. I frankly wasn’t understanding cluster bombs until seeing on film a huge capsule open with hundreds of “baby bombs” being dropped from the sky. The stories of children discovering and being injured by bombs while playing hit a chord with the kids. This is a must do. And make a large donation while you’re there — we saw at least a dozen people during our time in Lao missing limbs due to U.S. bombs and financial support is still needed to clear landmines. Movie Night at L’Estrange Cafe: Funny how being abroad for long periods of time makes one crave the comforts of home…a book in English, a BLT for lunch, a movie we can understand. L’Estrange provides all that and is an oasis for English speakers in LP. Downstairs are used books for sale and a cafe. Upstairs is a small museum on the ethnic tribes of Lao and a movie room. Every night an English movie is shown at 7PM. And you can go during the day and pick a movie to watch if anyone else lounging there agrees. The kids spent an afternoon watching Ice Age while an obliging Brit, Aussie and Indian giggled with us. Tamarind Cooking Class: Kyle took this all day class (lucky me that he is the chef in our family) and highly recommends it. He paid 270,000 kip (US$34) and was able to sign up two days in advance — during busy season, I’d get a reservation sooner. The site of the course is different than the restaurant, out of town on the river and beautiful! You cook up a storm with an engaging instructor, eat, and start again. The class also toured the Phousi market — if you’re a vegetarian, you might want to sit out the meat portion of the tour…yech. Big Brother Mouse: From 9-11AM and 5-7PM every weekday, students come to Big Brother Mouse to improve their language skills with native English speakers. This was a great way to learn more about the culture while adding value. You can just show up and chat but it helps to have a few lessons up your sleeve, e.g. have them pick a noun and describe it using the five senses. We were impressed to see students go to school all day and then spend each evening at BBM improving their English skills. You can also purchase books from BBM to either donate or take to villages on treks. BBM is easy to find behind 3 Nagas Restaurant. Palace Museum: Ok, the boys went here so I don’t have a first hand view. However they thought it was worthwhile — shares the history of the Lao royal family who was there one day and gone the next. It’s right at the beginning of the peninsula across from the library and Mt Phousi. Ock Pok Textiles: Julia, my mother and I spent half a day at Ock Pok learning Lao natural dying techniques. The setting is outside of town on the riverbanks — there’s a cafe for a welcome beverage and post class lunch or drink. 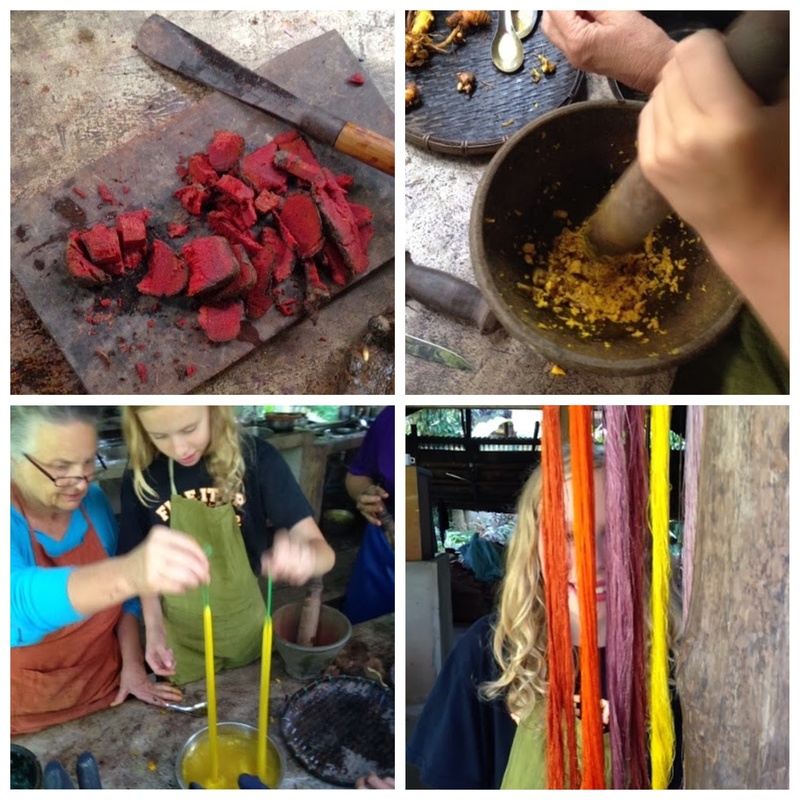 I really enjoyed picking and digging my dye ingredients from the garden…tamarind, beets, indigo. This was a fun, educational activity for three generations to do together. We walked away with a silk scarf and two silk samples — all that we dyed ourselves. Highly recommend. We stayed in five different places in LP. Most were great. The one we stayed in the longest was not. 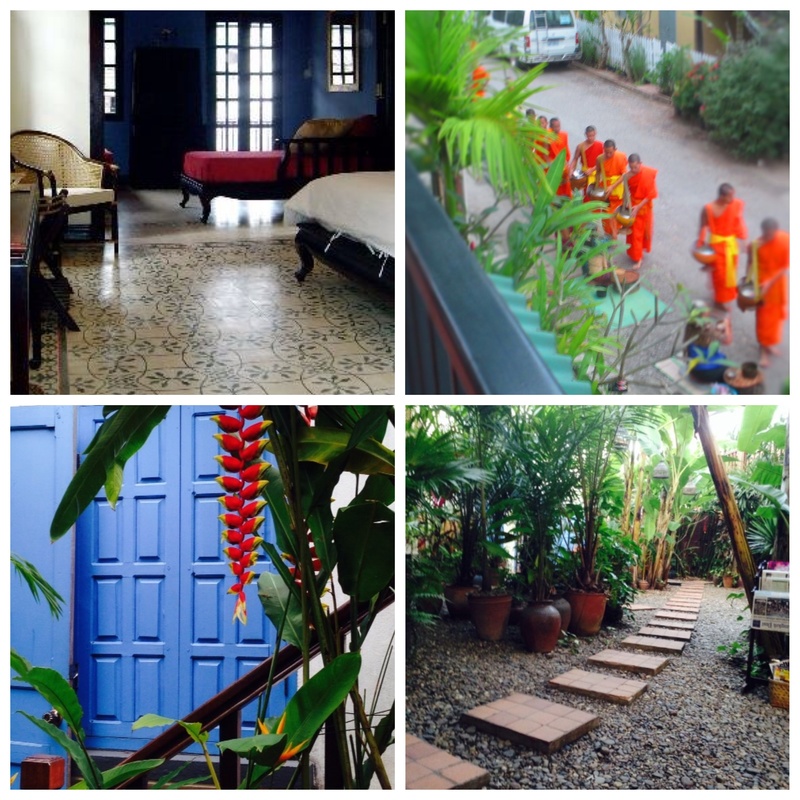 Thongbay Guesthouse: There’s a reason Thongbay is highly rated on TA. There’s just a wonderfully chill feeling there. The staff are so kind. The bungalows along the river are a must…eating breakfast each morning on your veranda watching the river life is a great way to get to know Lao. The food was delicious, the setting beautiful. We paid $75/night for a family bungalow. I’d call Thongbay more of an Eco-lodge. I think because of its rating on TA, people expect luxury, which Thongbay is not. It’s also a ten minute ride from the center however there are minibuses that go in regularly and a tuk tuk ride back runs 30,000 kip ($4). We’d go back there in a heartbeat. Private Home Rental: We had assumed we could meander into town and find a cheap, charming home rental for a month. Wrong. LP is bursting at the seams and in town home rentals are tough to find. Especially for only a month. We felt a little desperate and landed a house about a 20 minute walk from the peninsula. The price was right…$35/nt, and the space was good (3 bedrooms), but that was about it. The place just had a bad vibe, was not cleaned before we moved in and we had a constant feeling of “yuck” during our time there. The owners were very lovely people and apparently its not the norm to clean homes before renting them…so one learns along the way. Hillside Lifestyle Resort: To escape our city rat poop abode, we spent a weekend at this resort, about a 45 minute bumpy ride outside the city. I have alternating views of this place as either heaven or apocalyptic. The setting is gorgeous, the bungalows sweet. A Frenchman runs the place with an interesting staff — at times smoking, drinking BeerLeo and listening to jazz music because what else was there to do? We were the only guests during our stay — this is clearly an unfound gem. The food was quite good — a large and growing organic garden is on site. There are treks that can done from the resort. The pool is an interesting shade of green…slightly off putting but we enjoyed our swim, lounge and beverages everyday nevertheless! 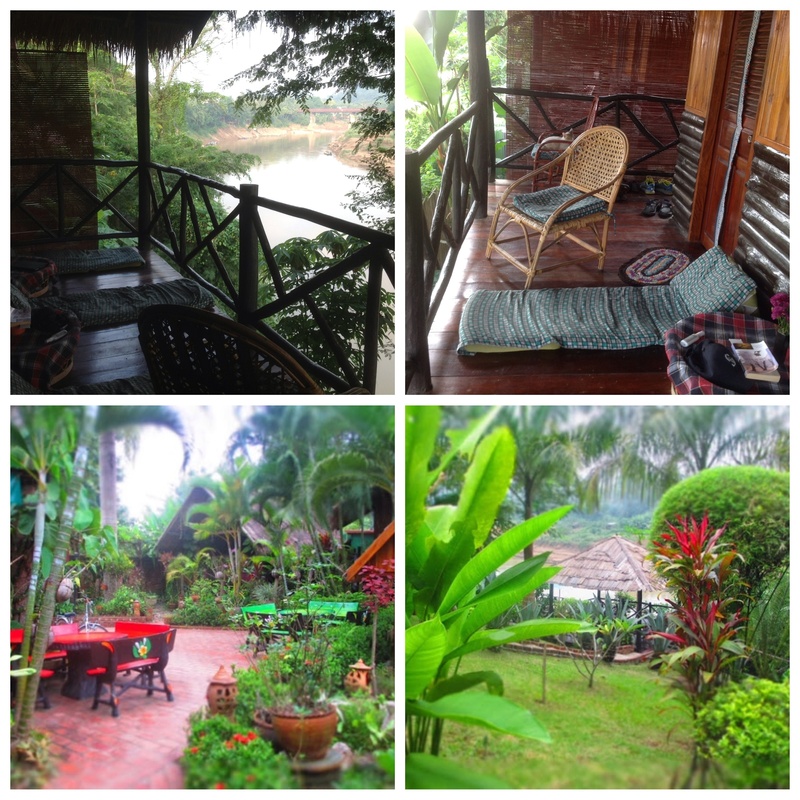 Lotus Villa Laos: Ahhh, to throw budget to the wind. We needed to be out of our rental by Oct 31st and had a few more nights in LP, so we splurged and moved to the peninsula. We stayed in one of the Orchid Suites, which are set up wonderfully for families. Our veranda was a perfect place to quietly watch the morning alms procession. The hotel also very carefully leads guests through the alms ceremony — we personally didn’t participate but I saw others doing so and it was clear the hotel took care in doing it right. The included breakfast each morning was very good and the location is as good as it gets — on a quiet street at the far end of the peninsula close to some of the best bakeries in town and riverfront restaurants. We paid $226/nt and at some point will need to not eat for a week to make up for that decadence. This is tough — we had some great meals in LP and spent a lot of time in the bathroom afterwards. I’m not going to call out which places made us sick because its always hard to really know where to attribute it. We enjoyed: L’Estrange, Tamarind, Le Banneton, Joma, Blue Lagoon, Dyen Sabai and Coconut Garden. Coconut Garden was a good find….clean food in a nice environment at a reasonable price. Dyen Sabai is a short boat ride across the river if the bamboo bridge isn’t up. It was a nice place to spend a few hours in a beautiful environment, sipping a beverage and playing board games. We did not eat there however the reviews of the food are quite good. If you know LP, you can tell by this list that we weren’t too adventurous. We didn’t enjoy the street baguettes and fruit smoothies as much as we hoped…so cheap but kind of tasteless. Shopping for essentials can be tough in LP. Set up your phone at Dara Market. The young women at the cellphone stalls all work together so it really doesn’t matter which you pick…they’ll happily take your phone and input the details so the data package gets loaded correctly. Sometimes you will need to reset the language on your phone to Lao so they can follow the prompts, then set it back. I paid under $10 for 1GB of data for my iPhone…when it ran out, I’d simply pop back and buy more. Across from Dara Market is the one grocery store that has cheese. Check the expiration date. This grocery also has wine and there is also a wine shop now on the peninsula. 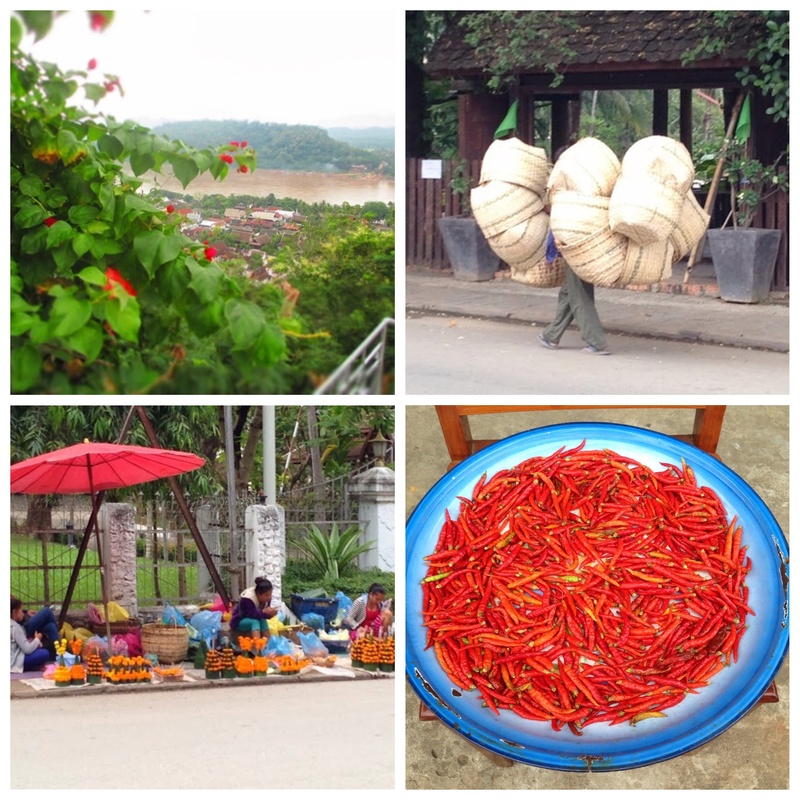 Yes, data, cheese and wine…these are my essentials for a month in the wonderful Luang Prabang.